This post is the cumulative work of our team at Panther Nation. Peter Lindholm previewed Colby-Amherst, Joe MacDonald covered Tufts-Williams, Damon Hatheway wrote Hamilton-Middlebury and Adam Lamont previewed Trinity-Bowdoin. How They Got Here: The defending national champion Lord Jeffs would have run the table for the third consecutive time in the NESCAC had it not been for an 80-75 loss at Colby in late January. Even with that blemish, however, the Lord Jeffs have been the class of the conference once again, finishing 9-1 with the conference’s top seed. Colby, on the other hand, set themselves up in the final weekend for a chance to be as high as the five seed, only to lose a seedings-flipping loss to Tufts, dropping the Mules to the eight seed and giving the Jumbos postseason life. The Mules of Colby College pulled off easily the biggest upset of this NESCAC season, beating the defending national champions, Amherst. It was Amherst’s first league loss since 2011, and remains their only NESCAC loss of the season. It took a nearly perfect performance from Colby, and they got it. The Mules shot 50.8 percent from the floor, highlighted by a 25-point, 5-10 from three showing from Patrick Stewart. What’s Changed: Amherst is Amherst. Amherst appears to have recovered fully from the “Thrill in Waterville,” winning their last five games by an average margin of 16 points a game. Colby has continued their momentum, winning 4 of their last 6, including an impressive win over Bates in Lewiston. As is the case in maybe every game Amherst plays, they are the heavy favorite, but Colby has proven that they have a formula to pull off another upset. The Lord Jeffs have another set of nets they’d like to cut down. Maybe the most important thing Colby has to do to have a chance is to feed sophomore big man Chris Hudnut early and often. In the first half of their game against Amherst, Middlebury was able to exploit a size advantage inside against the Lord Jeffs, and the Panthers certainly don’t have an inside threat on par with Hudnut, who’s averaging 18 points and 9 rebounds per game this year. If Hudnut’s presence is established early, Amherst will be forced to double him, which will open up outside shots for Stewart and Ryan Jann (44- and 37-percent shooters from three, respectively). Then there’s the Aaron Toomey problem. Toomey is clearly a great scorer, probably the best in NESCAC, but he is arguably more dangerous when he is involving his other electric teammates, like Tom Killian, David Kalema and Conner Green. If Toomey’s other teammates are well covered, he has tendency to force shots to overcompensate, primarily deep threes. If Colby can handle the other three primary scoring options, and force Toomey to be trigger happy off the dribble, they have a chance to pull off a rare double upset. As for Amherst, all they really have to do is be Amherst. The Lord Jeffs have so much more talent than the Mules, that if they play close to their full strength, this shouldn’t be much of a contest. As Luke Skywalker proved in A New Hope, and Colby confirmed on January 31, anything is possible. Beating Amherst once in a season has proven to be an enormous task the past three years. Beating the Lord Jeffs twice in the same season would seem to be impossible. Colby has a sophomore class that will haunt teams in the year(s) to come, but they don’t appear to be ready to go toe-to-toe with Amherst in LeFrak just yet. The Jumbos squeezed their way into the playoffs last weekend by the slimmest of margins. Tufts, Colby and Wesleyan all finished 4-6 in conference play, having gone all 1-1 against each other. Therefore, in order to decide which two of those three would move on to the playoffs, it came down to records against the conference’s top-four teams (Amherst, Williams, Middlebury and Bowdoin). Wesleyan threw up a fat oh-fer against the top tier, while Colby upset Amherst in Waterville at the end of January and Tufts surprised the Polar Bears in Medord in the teams’ regular-season finale. From there, the Jumbos were given the nod for the seventh seed based on their overtime victory over Colby last Friday night. The Jumbos’ reward? A first-round playoff matchup on the road with the ninth-ranked team in the nation. Aside from the season-opening, jaw-dropping loss at what turned out to be a neutral site against Southern Vermont, Williams has only lost once in Williamstown this year — to top-seeded Amherst. As the Pepin-faithful witnessed on that miserable Friday evening in January, this team knows how to win. They came storming back from a 16-point halftime deficit to beat the Panthers by three on the road, and rest assured they will not be surprised in the game’s first 20 minutes like they were against the Panthers. Tufts was in the game on the Ephs’ Senior Night for about 15 minutes. The teams were tied with 5:33 to play in the first half at 23-23. From that point on, the Ephs outscored Tufts 21-2 to close out the first half up 44-25. The Jumbos trailed by 30 at one point in the second half, and never got closer than 16. And all this was done without Williams’ senior Taylor Epley. Duncan Robinson had 25 points and 10 rebounds the first time these teams met. 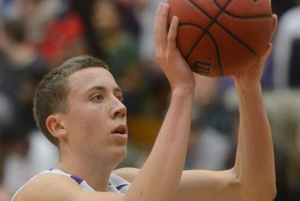 First-year Duncan Robinson, the conference’s most efficient scorer, had a monster game, scoring 25 points and grabbing 10 boards for the Ephs. Senior Michael Mayer had an almost equally dominant night, scoring 23 and snagging 10 boards. The Ephs played zone for 40 minutes and forced the Jumbos to shoot over their 2-3 look. The strategy was effective for Williams, as Tufts shot 9-32 from deep, good for 28 percent, equal to the Jumbos’ three-point-shooting percentage in conference. The zone helped to neutralize Tufts’ first-year big man Hunter Sabety, who scored eight on 3-7 shooting and had only four rebounds. Sabety, Tufts’ top scorer, would be worth of Rookie of the Year honors were it not for the incredible season of Robinson. But as with many talented young players, Sabety sometimes faded in big moments. Aside from the beat down against Williams, Sabety scored 10 on 3-10 shooting in the regular season finale, a game that Tufts needed to win to make the tournament, and Middlebury fans saw both sides of the talented big man in Pepin when he went 8-8 from the field in the first half and had his way with the Panthers’ big men and then went quiet in the second half as Middlebury fronted him. The Williams’ zone, with Mayer at the heart, dominated the paint. The Ephs had 50 rebounds to the Jumbos 44, and scored an amazing 52 points in the paint compared to just 22 for Tufts. What’s changed: The return of Taylor Epley. The big difference in this game will be the presence of Taylor Epley. Epley is a key factor for Williams, although with their depth the Ephs didn’t miss a beat last time against Tufts. Epley played in 21 games this year, starting 20 and averaged 13.5 points per game. Last year, Epley led the Ephs with 18.5 points per game, and for his career has 1,336 points, good for 12th on Williams’ all-time list. In Epley’s absence, Robinson has more than filled the void, but his return will just add another weapon for Williams. Another Williams starter was on the shelf for the Ephs in their last match up with Tufts: junior point guard Hayden Rooke-Ley. It is unclear whether or not Rooke-Ley will return to the lineup this Saturday, but if he does, a full starting lineup of Daniel Wohl, Rooke-Ley, Robinson, Epley and Mayer should overpower the Jumbos. As mentioned above, the Ephs contained Sabety by playing zone all game long, winning the rebounding battle and keeping Tufts’ offense out of the paint. The only scorers in double figures for Tufts were sophomore guard Stephen Haladyna and senior guard Kwame Firempong. Both shot well against the zone and Haladyna, at 6’5”, has the height to shoot over the zone, particularly if Rooke-Ley (6’1”) and especially Mike Greenman (5’8”) are in the game. But for Tufts to have a chance, they need to get more production in the paint from Sabety with a little help from fellow first-year Drew Madsen and senior Tommy Folliard. In general, everyone on Tufts will have to play their best game, including junior Ben Ferris, a former Rookie of the Year who was hampered by injury early on and has had a disappointing season. But the Jumbos’ offense needs to get effective touches inside. With the Jumbos playing the best basketball of their season, Tufts should stay competitive as they fight to play one more game. But there is too much experience and talent on the court for Williams for Tufts to handle. Mayer is what Sabety could be in a year or two, but Sabety doesn’t yet show the consistency that Mayer has. Mayer, Epley and Rooke-Ley (who will graduate in 2015 after receiving a redshirt last year), along with role players Matt McCreary, John Weinheimer and Greg Payton, have been Ephs for 112 games and have won 93 of those contests. They have been to two NCAA tournaments (and almost certainly will return this year) and experienced a Final Four their freshmen season. Add to that the incredible talent of Robinson and fellow first-year Daniel Aronowitz, and Williams boasts a well-rounded roster with experience that Tufts could not match in their first meeting, and likely will not this time around. How They Got Here: Middlebury’s regular season play was bookended by losses, tipping off with a three-point loss to Bates at home and culminating in a 17-point loss at Amherst. In between, the Panthers went 6-2 in the NESCAC, losing back-to-back games to Williams and the Continentals by a total of five points. Middlebury’s best conference victory was a 69-66 win over Bowdoin. The Panthers also needed last-second shots to beat Wesleyan and Conn. College on the road. Hamilton, on the other hand lost four of its first six games before finishing the season 4-1 to go 5-5 in conference. The Continentals were far better at home at Scott Field House than they were on the road, which accounted for four of their five conference losses. Hamilton went on a 32-12 run over the final 9:46 of the first half and the first 3:59 of the second half to take a commanding 14-point lead that Middlebury needed just 6:21 to erase. But Matt Hart made too many big shots down the stretch before Greg Newton won the game for the Continentals with six seconds left, negating a 19-point second half effort from Joey Kizel. Hart had one of the best performances of his career, scoring 30 points on 10 of 21 shooting from the field. Matt St. Amour had one of his best games in conference play the first time these teams met, scoring 12 points on 4-6 shooting. Two days later, St. Amour endured a season-ending injury at Keene State, cutting an up-and-down, but promising freshman season short. Matt Daley, who sat the first time these teams played will also watch the rest of Middlebury’s season from the bench as his attempt to return from multiple illnesses has proven unsuccessful. The Panthers therefore go into the postseason missing two of their opening-day starters due to a combination of injury and illness. Tightening the rotation hasn’t necessarily been a bad thing for the Panthers, but Middlebury has done a conspicuously good job of staying out of foul trouble and any further injuries or untimely whistles down the stretch for the Panthers will loom large. 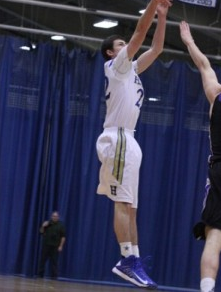 Matt Hart, the NESCAC’s leading scorer, burned the Panthers late in Hamilton’s 76-74 regular season victory. The electric sophomore proved too much for Middlebury the first time these teams met, despite a variety of different looks from Middlebury defenders. Jeff Brown has a quartet of defenders he can throw at Hart in Kizel, Jake Brown, James Jensen and Nate Bulluck, who provide a different combination of size, speed, strength and length. Whatever the case, no single Middlebury defender will matchup with Hart as Jeff Brown mixes and matches different looks in an attempt to keep the NESCAC’s leading scorer off balance. The Continentals (ironically?) have struggled to win on the road this season and while Pepin Gymnasium has not provided Middlebury its traditional home-court advantage this season, the Panthers have played far better at home of late. Middlebury has not lost at home and on the road to the same team in four seasons and has won each of its last six NESCAC quarterfinal matchups. Hamilton has exceeded expectations this season and has a player in Matt Hart who has the potential to singlehandedly keep his team in games, but behind Kizel this senior class should have more than enough to come away with a win in its final game in Pepin Gymnasium. How They Got Here: Bowdoin made a strong run as the NESCAC’s dark horse team, entering conference play undefeated and playing everyone on their schedule close. The wheels fell off down the stretch, however, as Bowdoin lost at Middlebury and at Tufts to finish a middling 6-4 as the tournament’s fourth seed. The four conference losses are the Polar Bears’ only four on the year, however, and Bowdoin remains a threat to make a run in both the NESCAC and the NCAA Tournament. Trinity, meanwhile, suffocated its opponents with physical defense and just enough offense to squeeze its way into the five seed after a 5-5 slate in NESCAC play. The teams played one of the most physical and low-scoring games in NESCAC history on January 31. The game was more like a rugby match at times and the final score was reminiscent of a JV basketball game rather than two of more competitive NESCAC teams this season. Quite literally it was a game the likes of which we haven’t seen in 65 years. Per the Bowdoin Athletic Department, the 46 points was the lowest amount of points Bowdoin had scored in a victory since 1949 when the Polar Bears defeated the University of Maine 42-33. That game also didn’t have a three-point line and in this year’s clanger the two teams combined for 35 attempted threes, but made just five. Nobody had a game to remember with John Swords leading all scorers with 11 points. George Papadeas almost brought Trinity back with his play in the second half, posting nine points and nine rebounds. The game was close the whole time with neither team leading by more than 10 points at any point. Trinity and Bowdoin are great defensive teams that both made it impossible to get easy layups. The difference came at the free throw line where Trinity faltered, going 5-13. Bowdoin was they made their free throws when they had to and as a veteran team didn’t lose their composure when they struggled to score. Besides Bowdoin’s loss to Tufts, the two teams have won the games they were favored in and lost as underdogs. Trinity still has a balanced attack that is led by forward Shay Ajayi and point guard Jaquann Starks. They have a good frontcourt that is physical on both ends of the flor. It looked like their offense was starting to come together, but last weekend’s 45-point output against Middlebury was a definite setback. Bowdoin remains centered on the play of John Swords in the middle on both offense and defense. On the perimeter Andrew Madlinger has continued to shoot a high volume of threes. Last time the team’s played was Bryan Hurley’s second game back from injury. He played 13 minutes in that game, but did not record a single statistic besides minutes. He remained scoreless the next three games he played, but he seemed to break out against Bates last Friday playing 22 minutes and hitting three treys, including one from NBA range. Yet the next day he only played 11 minutes, missing the only shot he took. He can’t move as well as usual because of the brace he wears, but is still effective from downtown if he can get some open looks. There isn’t any reason to expect a very different game from the first time these teams played. 1) Trinity three point shooting: A big reason Trinity poured 90 on Connecticut College earlier this season was that the Bantams shot 11-19 from beyond the arc. Compare that to a 1-9 performance against Middlebury last week and you start to get a sense of the feast or famine nature of their offense. Trinity does not have a pure shooter on the roster who can be counted on to make shots down the stretch. Starks attempts 4.9 field goals per game, but shoots less than 35 percent from the floor. Trinity’s two best hopes of scoring are getting John Swords into foul trouble or hitting outside shots. Even if Swords does get into foul trouble, the Trinity front court will not dominate Bowdoin’s Keegan Pieri, Matt Palecki and Neil Fuller. Bowdoin’s weakness on defense lies on the perimeter as seen by the big games Duncan Robinson, Connor Green and Stephen Haladyna enjoyed against the Polar Bears. Starks and Ajayi (11 points per game on 39/42/76 shooting) will need to make the most of the looks they get from deep. If Trinity hits some threes and shoot better than their 68 percent team average from the free throw line, their offense might have enough firepower to upset Bowdoin. 2) Rebounding Margin: Both teams are exceptional rebounding teams. People don’t concentrate on it when discussing why defenses are exceptional, but holding opponents to one shot is an extremely effective way of stopping teams. Bowdoin out-rebounds teams by 9.3 boards per game and Trinity is even better averaging 10 rebounds more than their opponents per game. In low-scoring games an extra possession carries even more importance than usual. Obviously Swords is a huge presence in terms of rebounds, but the battle will really be won by the other guys on the court like Grant White and Keegan Pieri for Bowdoin and Shay Ajayi and Edward Ogundeko for Trinity. In the first game rebounding kept the Bantams in the game as they had 17 offensive rebounds. A repeat performance of that would be huge for Trinity. 3) Lucas Hausman: He is the most effective player for Bowdoin creating his own shot. That isn’t always the most high-percentage shot, but when Hausman is on his game the Bowdoin offense is much more dynamic. He often plays in more bench-heavy lineups where his scoring is even more important given the lack of other options. His favorite move is a drive left into a spin and a fade-away jumper. Trinity plays man so even if Hausman isn’t scoring but gets into the lane and draws defenders, he could make the Bowdoin offense go. At the 43-second mark, Hausman successfully executes the move, but then nearly travels at the 1:13 mark. Those looking for an explosion offense will have to look elsewhere, but what this game will lack in scoring it should make up with intensity and defense. While it’s reasonable to expect both teams to make offensive adjustments, Trinity’s lack of scoring options down the stretch will continue to plague the Bantams. On the other end, the Polar Bears have won their fair share of close games and have better options late in games. Polar Bears by eight. Toomey and Robinson were no-brainers, as discussed below. Mayer came on strong late, finishing conference play with 19.4 points and 8.4 rebounds per game. Kizel’s 16.9 points, 5.6 assists, 5.5 rebounds, and 1.3 steals per game should earn him a third straight First-Team selection. Hart was somewhat one-dimensional, but that dimension (scoring) was good enough to earn a spot on the team: 21.0 points per game on 46/41/85 shooting. Killian was the closest to receiving a First Team nod, finishing in the top 10 in the conference in points and rebounds (14.8 and 7.0), playing the best defense in the conference, and finishing with an efficient shooting line of 48/36/80. Swords and Hudnut were both clearly deserving. Swords’ impact as the 7-footer in the middle of Bowdoin’s defense is not adequately captured by his 13.4 points, 9.5 rebounds, and 2.1 blocks per game. Hudnut is a step away from being a Sharry-like superstar down low, finishing the year with 17.9 points, 8.3 rebounds, and 3.4 assists per game on 48/32/84 shooting. The last two spots came down to Madlinger, Sabety, Dylan Sinnickson and Daniel Wohl. Madlinger earned the nod because of his excellent defense (a big part of Bowdoin’s conference-best 57.0 points allowed per game) and complete offense (13.0 points, 4.5 rebounds, 2.2 assists, 41/42/86 shooting). Sabety takes the final spot because of his 14.8 points and 2.9 blocks per game. Sinnickson surpassed all expectations this year (except maybe his own), finishing with 16.3 points and 6.5 rebounds per game, but his 1-10 showing against Trinity nudged him behind Madlinger and Sabety. Wohl did it all for Williams, putting up 11.8 points, 6.3 rebounds, 3.6 assists, and 1.0 steal per game, but his weaker scoring numbers kept him off. The headliner recruiting class lived up to expectations. In addition to Robinson and Sabety, there were great rookie performances all around the conference. David George, Mike Greenman, Matt St. Amour, Harry Rafferty, Zuri Pavlin, Malcolm Delpeche, Jake Brown, Edward Ogundeko, Tarik Smith, and Dan Aronowitz were among those first-year players who were major parts of their rotation this season. The Class of ’17 will contribute to a lot of great teams, games, and moments for the next three years in this conference. But the one above the talented crowd is clearly Duncan Robinson. Robinson had an unbelievable season and is already one of the best all-around players in the country. He was arguably the best player in the conference, which we will discuss below, but for here, we should appreciate that this award will be unanimous and that this was a freshman season for the ages. 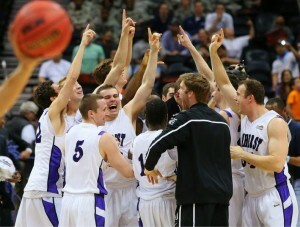 The senior class that Amherst lost was one of the best classes to come through the NESCAC in the last four years. Willy Workman was one of the top 2-3 players in the conference last season, Peter Kaasila was an efficient monster in the paint, and Allen Williamson was the best player on the team during their postseason run to conference and national titles. That Coach Hixon hardly missed a beat (yes, this year’s Amherst team is worse than last year’s, but it’s still better than any other team in the conference) speaks to his ability to recruit, develop and maximize talent. This was a three-way race for us, though we had a hard time knowing if we missed any obvious candidates. Based on everything that we saw, the three best defenders in the conference were Killian, Madlinger, and Swords. Either of the two Polar Bears could make a strong case, but Killian put together a hard resume to beat. Playing 37 minutes per game, Killian—one of the most athletic players in the conference—guarded a variety of top offensive threats, often playing shutdown defense, while also being the best defensive playmaker in the conference at 2.5 steals per game. If we were in the business of giving co-PoY’s, it would have been hard not to split this one between Toomey and Robinson. The Jeff and the Eph put together two distinct but dominant seasons. Toomey’s 21.0 points per game and 6.6 assists per game reflect truly elite offensive production. He shot an impressive 65% on 2-point field goals, and a decent 38% on 3-point field goals, to go along with 90% free throw shooting, second-best in the conference. Though he is a subpar man defender, Toomey’s 1.3 steals per game tied for 8th in the conference. His 5.2 rebounds per game was among the best in the conference among guards. He also deserves a lot of the credit for Amherst’s sustained excellence despite losing the senior trio. That said, Duncan Robinson put together a gem of a season himself. Robinson scored 18.9 points per game, shooting 75% on 2-point field goals and 53% on 3-point fields goals, making him the best pure scorer in the conference. Robinson led the conference in both 2-point and 3-point percentage. As in, the best three-point shooter in the conference had a higher field goal percentage inside of the arc than John Swords and Hunter Sabety — and it wasn’t even close. The 6’7″ versatile wingman is also a plus defender, and finished conference play with 1.2 steals and 1.1 blocks per game. He added 2.1 assists and 5.2 rebounds per contest. If you can have a flawless season as the top scorer on a top team nationally, it would look a lot like Duncan Robinson’s 2013-14. But Robinson missed one game out of ten in conference play, and Toomey’s points plus assists might surpass his efficiency deficiency, so we think the award should go to the Amherst senior. However, both should be remembered as deserving candidates. For the first time in recent memory Middlebury travels to LeFrak with nothing to play for in the NESCAC standings. Middlebury’s victory over Trinity, coupled with Hamilton’s loss to Wesleyan, on Friday guaranteed the Panthers a home game in the first round of the NESCAC Tournament. Today, with Middlebury off, Bowdoin lost on the road to Tufts, slotting the Panthers in the 3 seed. So win or loss tomorrow at Amherst, Middlebury will host Hamilton — the 6 seed, and one of Middlebury’s three conference losses — next Friday. The same is not true for Amherst, who need a win tomorrow to secure the number one overall seed. Should the Lord Jeffs lose, Williams would host, despite having already lost twice to Amherst this year. And simply because the Panthers are locked into the 3 seed doesn’t mean Middlebury won’t play to the level we’ve become accustomed to seeing when these two teams play. While the only certain path to a NCAA berth for Middlebury is the AQ bid from winning the NESCAC Tournament, the Panthers could conceivably earn a Pool C bid with a win over Amherst tomorrow and a trip to the NESCAC title game. Returning to the matchup, the last time these two teams played, Middlebury failed to box out the Lord Jeffs in a 104-101 triple overtime loss in what was likely the greatest game ever played in Pepin Gymnasium. Both teams played at an incredibly high level and the game’s final 20 minutes were highlighted by one tremendous play followed by the next. Regardless, Middelbury ended up on the wrong end of a once-in-a-season, but-twice-if-you’re-Middlebury play by Willy Workman who saved the Lord Jeffs at the end of the first overtime and gave them a chance to win. Nobody has forgotten that game and for many, the two losses in LeFrak during 2012 loom equally large. 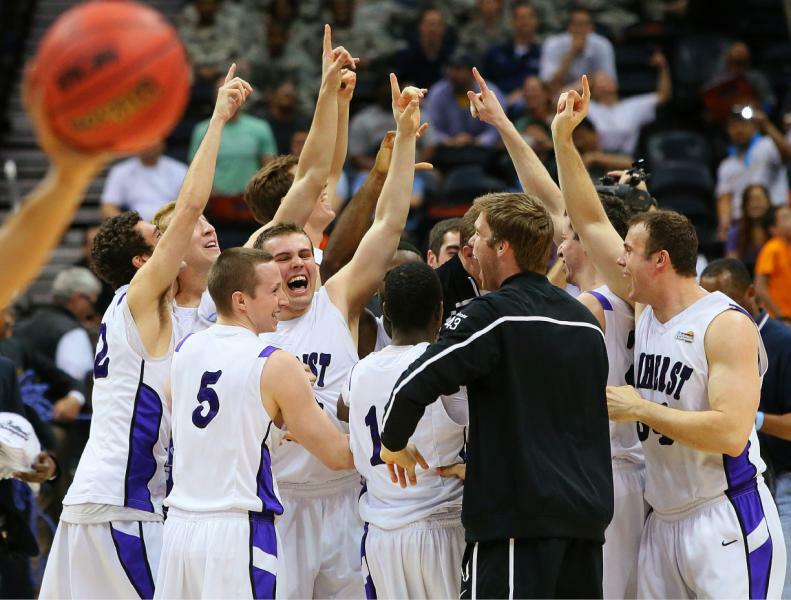 Middlebury hasn’t beaten Amherst since the 2011 NESCAC semifinals, when the Panthers overcame a 16-point second-half deficit to advance to the NESCAC finals. Why might today be different? Middlebury is playing arguably its best team basketball of the season, the Panthers could be bolstered further by the return of Matt Daley and Amherst has not been quite as dominant in the conference as their record suggests. As a team the Lord Jeffs have shot just 44 percent from the floor in conference play and 34 percent from beyond the arc. The drop off has been most apparent in Connor Green, who appeared to be making an All-NESCAC case early in the year, but has shot just 36 percent from the floor and 24 percent from three in NESCAC play. The other guy who has played a significantly smaller role in conference play is David George, who enters the final game of his NESCAC rookie regular season averaging 17 minutes per game while scoring just 3.2 points per game. George remains a dominant defensive presence in the post, averaging 1.6 blocks per game and the third highest blocks per minute in the NESCAC, but the offensive game has not consistently materialized late in the year for the Lord Jeffs’ promising big man. Aaron Toomey has continued to carry Amherst, averaging 21 points per game on 46/37/92 shooting splits, but has historically struggled in this matchup. In the five previous games between these two teams, Toomey has shot a combined 25 percent from the field, while scoring just 11 points per game. Whether the D3 Player of the Year continues to struggle against Middlebury in spite of the graduation of NESCAC Defensive Player of the Year, Nolan Thompson, will be one of the keys to today’s game. Joey Kizel, meanwhile, has enjoyed consistent success against Amherst (though not necessarily in the win column), averaging 17 points per game on 46 percent shooting from the floor. Kizel is playing easily his best basketball of the season, following up a week in which he won NESCAC Player of the Week honors with a 15-point, 12-rebound performance in Middlebury’s road win over Trinity on Friday. Outside of Toomey and Kizel, the biggest difference makers for Middlebury and Amherst will likely be Dylan Sinnickson and Tom Killian. Sinnickson may be the hardest player to defend in the NESCAC and the Panthers will live and die at times with his jump shot. Fortunately that did not happen in Hartford, as Middlebury overcame a poor shooting night from Sinnickson, who has put together an All-NESCAC caliber season. Even after Friday’s 1-10 performance, Sinnickson leads the team averaging 16.4 points per game while shooting better than 46 percent from the field and 44 percent from beyond the arc. For the Lord Jeffs that player appears to be Tom Killian, who is second in scoring in NESCAC play, averaging 14.4 points per game on 45/35/80 splits. Killian can do a little bit of everything offensively, but makes his mark on the defensive end where he is averaging 2.7 steals per game and 6.4 rebounds in conference play. While he is not as prone for an offensive outburst as Sinnickson, Killian makes important contributions in all three phases of the game and could be the athletic swing forward who can check a player like Sinnickson. The front line names in this game (Kizel, Toomey) are well known and will be fun to watch, but this game will likely be decided by who gets more production from their role players around those guys. This game will be decided by the Merrymans, Greens, Kalemas and Browns more so than the All-American guards headlining things. This is not a must-win game for the Panthers necessarily, but boy, every time you head to LeFrak it sure feels that way.